"These footprints in the southern Colorado grasslands definitely don't belong to a human being. A cow, perhaps? Maybe a buffalo? @mattstaver took this photo at #PicketwireCanyon, a #dinosaur lover's dream site, which boasts hundreds of hubcap-size footprints like these. 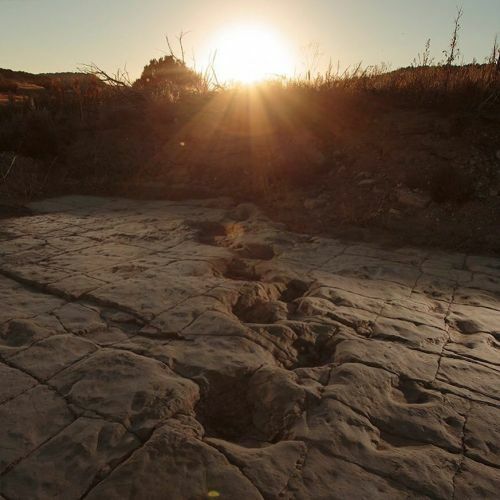 Volunteers have been working to uncover the prints, which belong to theropods (bipedal carnivores whose prints show 3 talonlike toes) and sauropods (herbivores that walked on all fours, leaving circular prints like potholes). Some of the theropod tracks follow, and sometimes overlap, those of sauropods. For this reason, some at the site — which is a 2-hour ride down a dirt road, far from signs of human life — guessed that the tracks might be a sign of predatory theropods stalking their sauropod prey. #🐲#👣#dinosaurtracks" By nytimes on Instagram.